I LOVE Starbucks! I love everything about it – I like the coffee. I like the baristas. I like the environment. I like the food. I like the feel of being there. Most of all, I like the secrets to the Starbucks loyalty rewards program (use my link to sign up for Starbucks and get a free drink)! Note: As of April 2016, Starbucks has changed their rewards system. Once I update this article to reflect the changes, I’ll post the article here. 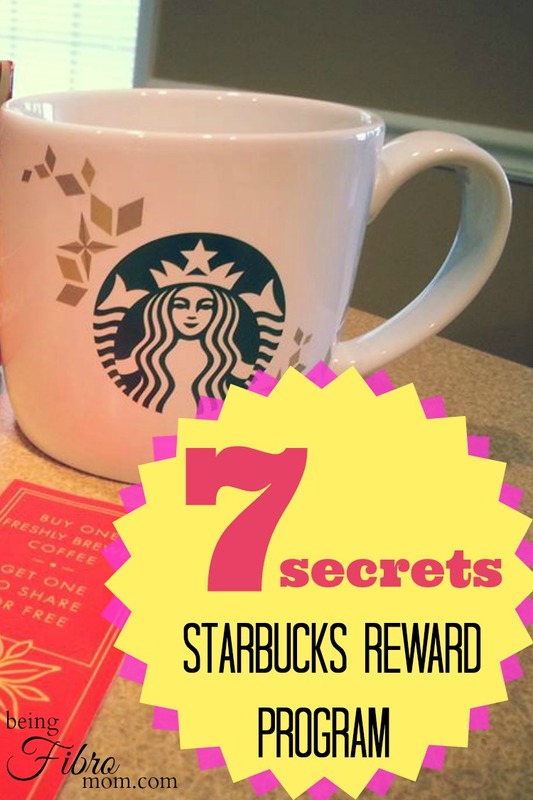 how to become a frugal Starbucks aficionado! Disclaimer: This post is not sponsored by Starbucks; however, it does contain affiliate links, but all opinions are my own and are at no extra costs to you. Read my full disclosure policy. **Update** I recently got this personalized Starbucks cup and receive .10 cents off each time I use it at the Starbucks store. Please visit R U Shirt N Me on Facebook to make your order! Each time you make a purchase at a Starbucks location, use your registered Starbucks card to earn a star. After so many stars, receive reward level benefits! Get a Starbucks gift card either online or in a store. 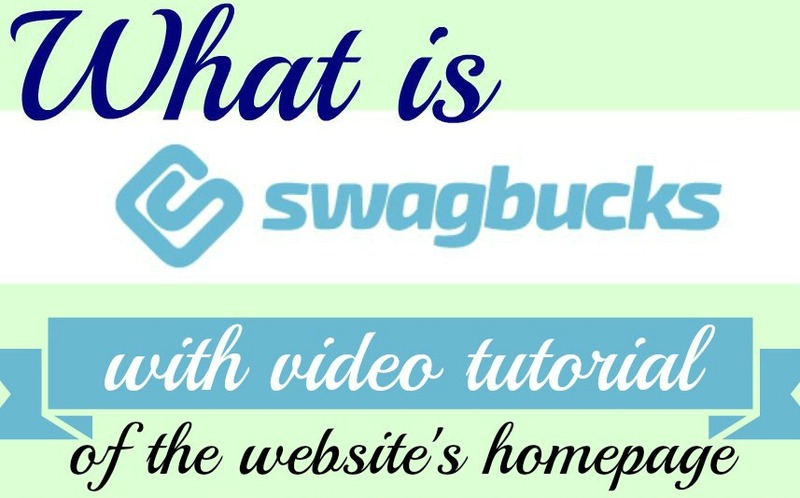 Pssst..ask for one for your next birthday, anniversary or holiday to be really frugal or use Swagbucks! Register the gift card online with Starbucks or through the Starbucks app. Done! You can now start using it to earn rewards! **NOTE: Please be sure to opt-in to receive all texts and/or emails. They will notify you of free earned rewards, upcoming promotions, sales, coupons, etc. Please make sure to sign up! Step by step instructions (with screenshots) are further down in this post. **Update** Starbucks confirmed that emails to members are exclusive to each member and are generated based on the members activity at Starbucks (in store and online). There are three levels in the rewards program. Each level is determined by how many stars you earn in a twelve month period. In other words, the more Starbucks you enjoy, the higher the level! Welcome: Start at this level when you register your Starbucks gift card. Get a free drink or treat on your birthday. Enjoy 15% off your purchase at StarbucksStore.com. Green: After you earn your first five stars, you advance to the Green level. At this level enjoy the Welcome level benefits plus free brewed and ice coffee and tea refills during your visit at a participating store* when paying with your registered rewards card. Gold (and my favorite level):Collecting 30 stars in twelve months puts you at the Gold level! I love this level and here’s why – you get all the Welcome and Green level benefits plus a free drink or food for every 12 stars earned. By the way – that free drink is any size!! How awesome is that?? 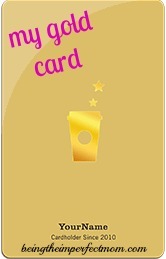 You also receive a personalized gold card! *I want to quickly point out the stress of participating stores. Where I use to live, Starbucks stores are located in the Target and Harris Teeter food store. They are not the stand alone stores. 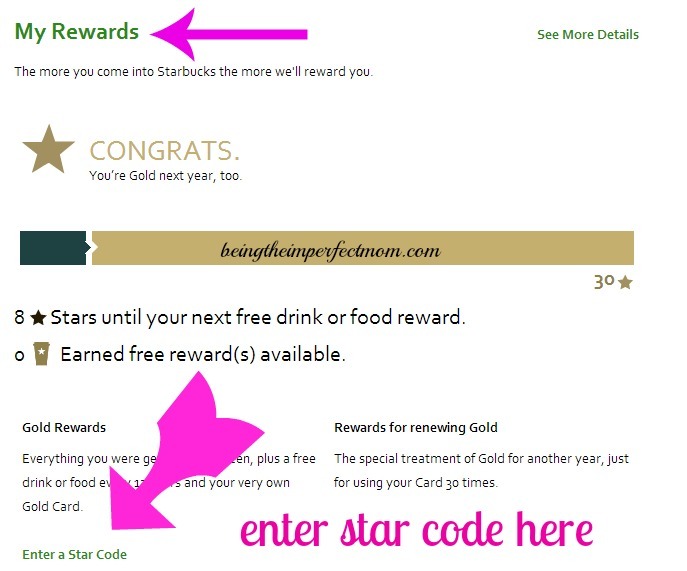 At these types of stores, Starbucks will give stars for each purchase when paying with a registered card, but do not honor coupon codes sent to your email and do not redeem free drinks/food for earned stars. Please do not let this discourage you! The earned free stars can be saved for a few months, so save them for later when you are near a participating Starbucks store. 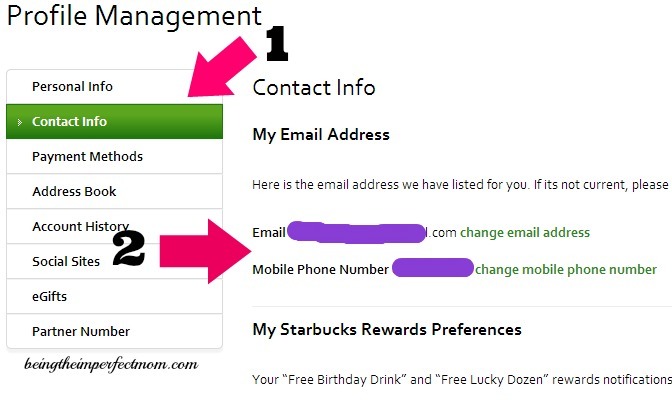 **Update** A reader informed me that if your local Target’s Starbucks does not redeem the lucky dozen and birthday rewards, contact Starbucks and they will give you the freebie treat in your cash balance. **Update** The Starbucks in Target near my hometown now redeems stars; however, they cannot use coupon codes. When making purchases, ask the cashier to ring up each purchase individually. Each purchase gives you one star which means faster way to higher reward levels and free treats! For example, if I’m getting a café mocha with a slice of their amazingly delicious pumpkin bread, I ask for him/her to ring up the bread first and pay for it (one star!) and then ring up the coffee and pay for it (another star!). I just got two stars from my one stop! Pretty cool, huh? And I’ve never met a disgruntled Starbucks barista, so this has never been a problem for me. Thank you to all you Starbucks baristas! Purchase specially marked bags of Starbucks coffee that contain a star code. These can be found at your local grocery store and have a gold sticker affixed to the front. Once purchased, peel off the sticker, find the code on the back, and enter online (instructions to enter the codes, with screen shots, are further down in this post). Earn bonus stars during appointed dates or times. These notices will be sent via text or email. For example, from January 7 to January 10 earn a bonus star for coffees bought after 2 pm (this is an example only and does not apply to the current year). Participate in the Star Dash! The Star Dash is when so many stars are earned during a specified time frame and rewarded with more gift cards. Emails and texts will be sent to registered card holders for specific dates and rewards. For example, during the month of December if I earned 10 stars in two weeks, I got a $5 Starbucks gift card or earn 20 stars in four weeks, I get a $10 Starbucks gift card. (These numbers are just examples. I do not know the exact number of required stars.) Learn how to earn bonus stars during the star dash. Participate in exclusive email and text messaging offers such as buy a $5 gift card for a friend and receive a $5 gift card for yourself. Or, reload your Starbucks gift card through your account and receive a $5 gift card. These email and text offers will only be sent to registered card holders. BOGO! Often Starbucks will have promotional periods where they will give you a free drink for buying a drink. The most popular is the buy one Frappuccino and get a free Frappuccino for a friend! I love those deals and usually participate with my sister. Again, this offer alerts registered card holders via email and/or text. Target’s free Starbucks gift card with purchase deals! Target will often times have deals where you buy four bags of Starbucks coffee and receive a $5 Starbucks gift card. This is usually when I stock up on my bags of coffee to brew at home. Update: Target has not had this deal in over a year, so I’m not sure if they still do this. Please contact me if you know any information regarding this deal. Thanks for this post. I love Starbucks and have been curious about this program and how it all works. So far I’ve earned about 20 dollars in Starbucks cards. Every little bit counts, right? Amazing post – thank you!! We’ve been taking advantage of our ‘Earn 6 Stars’ for every tea latte (hot or cold): Too bad the promotion ends on April 13th, 2015! Can’t wait to see what the next Starbucks promotion is – it’s bound to be enticing. Cheers!! Great Post! Many thanks! 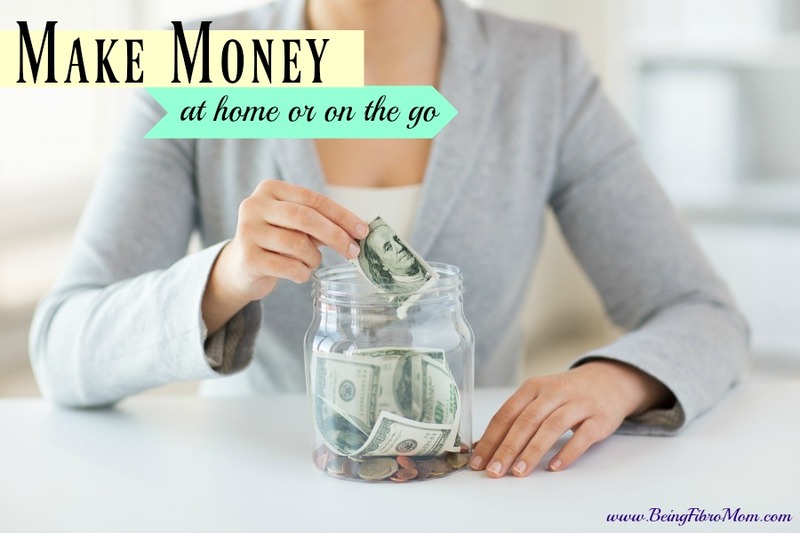 You can get even more free money with the Ibotta app….yes I said FREE MONEY from your everyday grocery, mall, starbucks, or whatever shopping right on your phone. It’s a no brainer. They even give you $5 just to sign up.. https://ibotta.com/r/mqcjhue. Check it out! I love Ibotta! It’s so easy! Wow. You sure have it all figured out. Almost makes me want to start drinking coffee again just to enjoy the bonuses! This is probably my favorite blog post in the history of ever! Thanks girl! Great tips. I always get stuck in the green level. I am going to try your tips and hopefully I’ll get in the gold this year. I waited till the last day to do my Starbucks Star Dash for 2015 (yeah, I know — stupid….) – buy 5 get 20 was my offer. I wasn’t sure if I could do all 5 purchases in 1 day to qualify – but I tried. Had a couple lattes & 3 baked goods – all on separate tickets, of course. Wohoo – received an email today that I met the challenge. So that question is answered = yes, you can earn all your stars (with in-store purchases) in 1 day for Star Dashes. Wohoo! 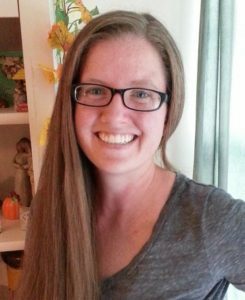 Heather – sign up for texts and email offers ASAP. You’ll get great offers that will zoom you into Gold — pronto. It’s SOOO worth it. Personally, I am just blessed to receive anything from Starbucks for loyalty — they beat any program out there, even the local stores don’t offer things like free birthday drink – or like buy 5 get 20 points! With Gold, that’s 2 free drinks with 5 purchases. Can’t beat that! Starbucks is expensive, but their bonuses make it pretty painless. It’s my one ‘spoil me vice’ — and it’s a whole lot cheaper than some other addicitions I can think of . . . I don’t think Star Dash works when you have a Gold card. I didn’t get any Star Dash emails like I did last year. I’m now participating in the collecting stars with the purchase of bags of coffee. I get 10 stars if I turn in 3 codes from bags of coffee. (1 code = 1 star, 2 codes = 5 stars, 3 codes = 10 stars) Thankfully, I didn’t use all my codes from previous purchases from a recommendation by a friend. She said wait until an offer comes like this, or when you need to reach a gold fast. Don’t just turn them in when you get them. She also suggested, since they are sticky after you peel them off the coffee bag is to place them on a sheet of plastic wrap. That way you can still read them and not have them sticking to other objects in your coupon drawer. I guess why I didn’t get the Star Dash emails, is because Im already a gold member and maintaining the required 30 stars a year is motivation enough for you to keep it current standings. Though I got down to the wire with needed 2 stars to continue my gold status. I receive reminder emails that my card was about to expire. I didn’t fret. 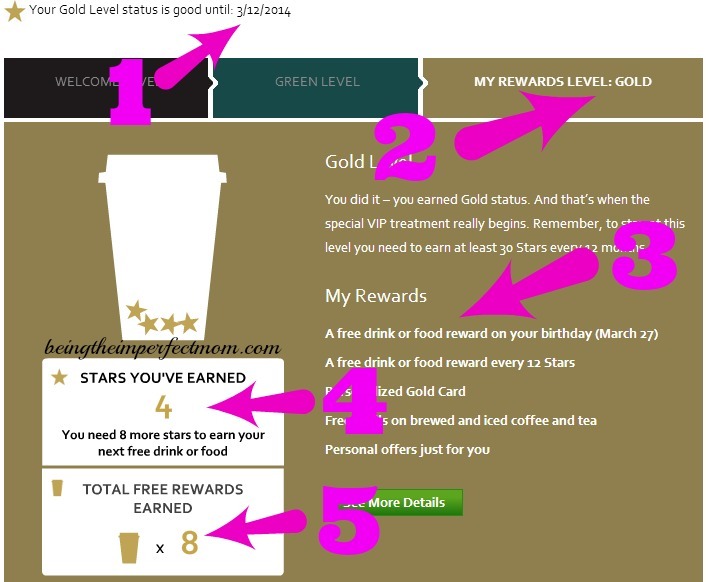 Then about 2 weeks before it expired SB sent me CUSTOM email, with my name included in a graphic of that email, to double my stars if I bought a drink so I can reach my goal. Having your name printed on cup of coffee was creepy but cool, it does get your attention. I also received another custom email if I reloaded my card with $25 they would ADD $10 to my card. I think I received this offer because my card had $0 dollars and I had not visited SB in months. Hi, I have had a gold card for years and I do get star dash emails… maybe it is just random. Great post! Much better than the actual Starbucks web site at explaining the program. Another cool thing I do with my card: save up my coins (or empty my purse when I do the big grocery shopping) and use a Coinstar machine. You get 100% of your money (no 10% deduction from the machine) if you convert the coins to a gift card. Last week I dumped the massive stockpile of change jingling in my handbag and added 17.60 to my account. –It prints a paper voucher with a digital Starbucks card number. In the car, I open my Starbucks App. This creates an additional Starbucks card. -Select “Transfer Balance” on that Starbucks Card icon. -Transfer the balance to your main card. This has been a great boost to my account, where I used to just apply Coinstar vouchers to my big grocery shopping trips–with a 10 cent/dollar fee. Another strategy is if you have another person who’s wanting a Frap or Coffee, especially a wife or husband, get them to load your App on their phone with your username and password. And order separately, this would count as two separate transactions. There are times when I would request to have the transactions done separately but you might get a grumpy Batista (rare but it happens). So this is an excellent way to rack up your stars! just take a screen shot of the pay screen and message it to them, it’s the same every time, not a fresh bar-code each transaction. Thanks, Brandi! I’m pretty new at having a SB card, so this is a big help! Has anyone else noticed that sometimes there is a duplicate rewards number on prepackaged coffee??? Its happened to me twice!! I buy big bags of Starbucks coffee a Sam’s. When this happens, please contact Starbucks with a photo of the duplicate numbers and they will replace one of them. 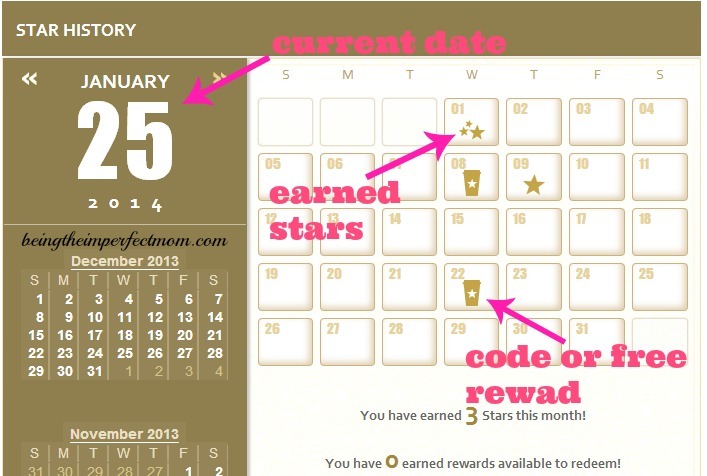 I ve been saving my star code stickers and now there’s a promo for rewards w purchase of 3 specific types of coffee. Any way to de code them t see which is which? Thanks! No, I don’t know. I’m sorry I can’t help you! I just joined the Starbucks Rewards program this year, and I’ll confess it’s encouraged me to be a pretty loyal customer! A couple of days later, the Star Dash started. My promo was something like “Make 5 purchases, get 9 bonus stars; make 10 purchases, get 15 bonus stars.” Okay. So I started making trips to the store over the next few days, earning some stars. Right after I made my fourth purchase, I checked my account and it said “You’ve finished the Star Dash! Your 15 stars will be credited on [date].” What? How? It turned out that the 6 bonus stars I earned for the reload had been credited on that day, and the Star Dash counted those bonus stars as if they were 6 purchases! I don’t know if this is a feature or a bug, but those overlapping promotions sure worked in my favor! Awesome! And the best part is that the member emails are exclusive to each member! Thanks for sharing! Awesome post. I guess I’m already a pro at this, because I already practice the things you stated. I have one question. Do they store your free 12 star drink reward? I just earn one a couple weeks ago and I’m 2 stars from earning another. I have taken advantage of the free reward. They usually expire, but it’s usually two months I believe. Thanks for commenting! Great post! I go to Starbucks a lot (I’m a gold member) and never thought to pay for things separately for extra stars! Usually my girls are with me and my little one will want a boxed milk and my older one wants a snack. I could be earning three stars each time…you are a genious! Haha Thank you! I’m glad I could help! It’s intricate, but very easy to use! thanks for stopping by and commenting! 1- I signed into my rewards card today and saw that I had a “code” for a free drink. Where am I supposed to enter this “code” or is it just automatically loaded to my card for redemption? It seems weird that they listed a specific code “### – MSR- free drink” then it said “enter ###” to redeem…. 3- I think from what I read on our site (which is an awesome site!!!) You can use your app/rewards card at Starbucks in Target/HT and it will count towards purchases to earn rewards but you cannot pay with it? Is that correct? I’m always getting Starbucks at Target and I like to use my Red Card to get 5% off but how do I get the rewards? Do I just hand them my rewards card and ask them to swipe it? Then do I swipe my Red Card? Sorry – I’m a novice and you seem like you know the process! I appreciate any input you could offer my confused brain. 1. Just give the code to the Starbucks cashier. She will enter that code to give you a free drink. It’s most likely on your card, too, but it depends on what the free drink is from. 2. Yes, that is true. Keep track through the app or online. At the Starbucks store, you can tell them you have a free item and they will ask you if it’s for a star code redemption or birthday reward. 3. Yes, you can pay with your gold card or Starbucks card at the Starbucks in Target and Harris Teeter; however, you cannot redeem codes or coupons at those Starbucks. No, you cannot use the Starbucks gold card and the Target red card to pay. Use either the Target card or the Starbucks card to pay. I hope this clears it up. If you have any further questions, please contact me. I enjoy Starbucks but don’t go very often, only once a month during book club nights. Thanks for sharing with Small Victories Sunday Linkup. Pinning to our linkup board and thanks for being an awesome host! I don’t go as much as I use to, but when I do go I enjoy the new drinks and treats they have. Thanks for commenting! Just wanted to add. Most in stores like target SB will not honor the free drinks and such. However if you call starbucks and tell them your local store don’t accept the freebies Starbucks will add your free drink promo to your available cash balance so you can redeem your free drinks . I do this all the time. They are happy to do it. I think all starbucks locations should be the same but they are not. And racking up stars is easy. Today I bought 11 items. I had each one rung up seperatly . I got 11 stars today. I understand if they are really super busy they don’t want to do this but remember you are the customer so if you want 100 items rung up seperatly they have to do it. That’s so great to know! Thanks for sharing that information. I’ll update my post to reflect it. My local Target Starbucks just started redeeming birthday rewards and the lucky dozen reward. I was happy about that! I use the mobile pay feature in the app to order in advance. I order each item individually (to max out my stars) and everything is just waiting for me when I arrive at the store! That’s so great! I’ve been wanting to use that feature, but I’m not close to a Starbucks store any more. You’re welcome! I’m so glad I could show you how to benefit from the rewards program! Eg 1) Anytime you get a “Triple Shot” of Tall, Grande, Venti drinks if you know your Barista well; DO ASK THEM in a FRIENDLY tone (after you paid) if they mind giving you the “4th Shot of Espresso” for FREE??!! Really Why not? The Barista always requires to pull “Double Shots” so they end up throwing the single away. 2) When you order an Americano or any Latte, make sure your shots aren’t “DEAD Shots” – there’s always Hot Water or Milk to hold the Espresso Shots. You can taste the difference. 4) If you’re “Lactose Intolerant”, check your BAR-ista he/she is using a Lactose Free Milk Jug or Cold Jug. I’ve ordered many times & caught staff using a regular “2% Milk” jug than pour Lactose Free Milk to make my Latte. She didn’t apologized, and the Manager didn’t apologized. 5) Airports Starbucks & Vegas Starbucks aren’t part of the Rewards programs + they’re super expensive!! Thank you for the many tips, and the useful information! You told me many informative points I wasn’t aware. Thanks! Stars are now earned on each dollar spent, ( 2 stars per dollar) No need to ring purchases in separately, that I always found stupido. You need now 125 stars to get a free drink, that means you have spent at least 63 dollars canadian. Compared to the 12 stars before, a coffee at 2.10 is only 25.20 for a free drink. so yes, starbucks made it more difficult to get the next free drink. But at least now you get stars for any purchase, they want you to buy more other things then a single coffee !!! But there are now stardays looks like once a month , wich will give you double the stars for each dollar. You are right. Thanks for bringing that to my attention. I will update this post to reflect the new changes. Thank you! We need tips on how to make the most out of the NEW Starbucks REWARDS program.I know there are many ways to earn bonus stars if you check your email and click on link. I cannot remove it from my side. There should be an edit button to click in order to adjust your settings.